← Mr. Fish: Love Me! In a recent post we entered the notion that “history” is a construction, with no two individuals or nations sharing the same perspectives on events of the past. Thanks to the always interesting Metafilter, we chanced on an unusual construction of an 1862 U.S. history from a Japan that had, until nine years previously, barred entry to their nation’s mainland by traders and adventures from the West and only opened up after Commodore Matthew Perry landed on the shores of Tokyo Bay on 8 July 1853.its shores, backed by the guns of his famous Black Fleet. 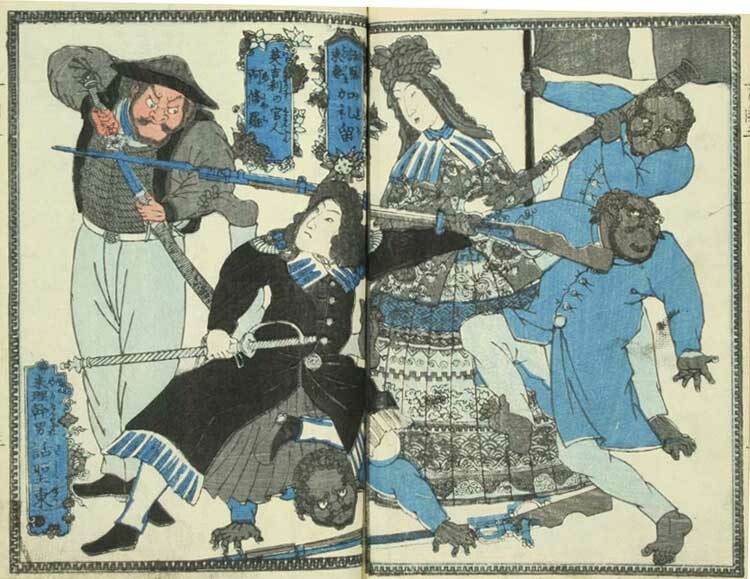 Rutgers University historian Nick Kapur recently tweeted some starling images from Osanaetoki Bankokubanashi by Kanagaki Robun, a child’s history of America drawn for second-hand sources. The volume, a precursor the today’s manga, features George Washington [and his wife “Mary”], Benjamin Franklin, as well as Bennie’s arch-enemy and would-be assassin John Adams, as well as other curious characters. There’s a truly buizarre series of illustrations of John Adams’ spouse begging eaten by a giant snake, after which the Mountain Fairy lends him a hand to enact his revenge, as so much more. The while book may be view online here. This entry was posted in Asia, Children, Culture, History. Bookmark the permalink.